What a beautiful Easter Sunday. What a nice day! On the drive back from Easter dinner, I turned on the GPS and headed for home taking all the back country roads I could find. I am still on my quest to take as many shots as possible of anything that catches my eye for the sake of building up a ‘knowledge base’ to work from in the future. I’m not showing these shots as examples of the best that can be done. Only what I have been able to find so far and recording these ‘items of interest’ for future consideration. 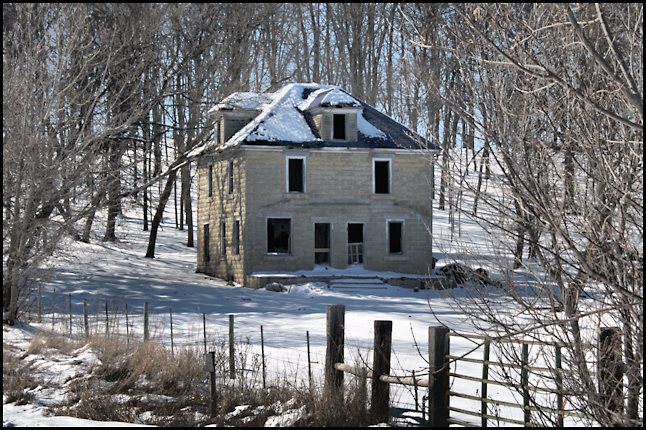 I was struck by this old house (click on the photo for a larger view). At first glance, it looks rock solid. Then when you look closer, all the windows are gone, the front porch has been ripped off, and it looks like just a lot of junk stored inside. I shot the house hand held and had a long zoom lens on at the time. I am not real happy with the sharpness. The front looks like it is out of focus. 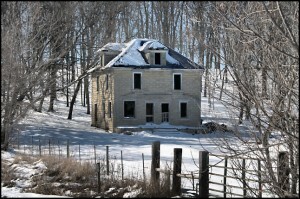 But the side of the house and posts in the foreground seem like they are, so I am having trouble figuring this out. I do think I’ll plan on checking this spot out again in the future and will use a tripod the next time. Nothing makes me more sad than looking through a bunch of shots and seeing half of them not sharp or in focus. But we all keep learning. 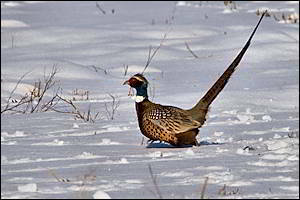 Then a little farther down the road, I ran across this ring necked pheasant. Bright sun, bright snow. A nice opportunity. But the little buggers run so fast! He was moving along at quite a clip when I ‘shot’ him. I am rather happy with this one. Again, no where near tack sharp focus and that’s too bad. But the little buggers run so fast! (Or did I already say that?) 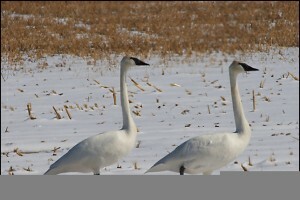 Later, again on a back gravel road, I found two Trumpeter swans digging around for corn in a stubble field. But they sure didn’t like it when I stopped to immortalize them on this web site. 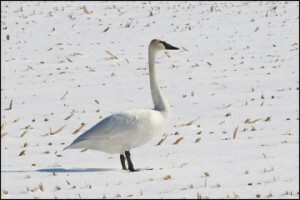 Trumpeters are the largest native North American bird. They are a protected species now, but they were nearly hunted to extinction 100 years ago or so. Wikipedia has a short but informative article if you are so inclined. Since they have not been (legally) hunted for a long time, they are not very fearful. But they definitely don’t like it if you get too close. And while I really like shooting them (with the camera), I hate to bother them too much. I rather like seeing them. Wildlife photography is a field all of it’s own. And over the years I have become convinced about two things. First, that taking a tack sharp good photo of a wild animal is one of the most enjoyable things to do in outdoor photography. And secondly, that it is nearly impossible unless you are really willing to spend the time and effort to do so. (And going to the zoo or a game reserve with tame animals doesn’t count.) Wildlife photography takes more than talent and gear. It takes TIME. Lot’s of time, usually. The Trumpeter shots here are nice enough for a photo to remember that you actually took a picture of one. But because of their low fear of humans, they nearly fall into the tame category. To get a true shot of a ‘wild’ wild animal, you do need to spend time in blinds, or well hidden waiting and it can take hours and hours before you actually get a good shot. The purpose of this blog is to talk about how we (as non-professional photographers) can take better photos. Perhaps wildlife photography would be a good subject to address on it’s own. Maybe we can find some short cuts. And here is one more barn to add to my (never ending it seems) collection of old barns that I’m building. Can you believe all the different colored shingles on the roof? (Click on the photo for a larger view.) 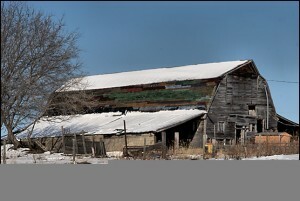 I can’t wait for the snow to melt off the other two roofs and then go back and give this old barn a serious photo session. I am looking forward to some stormy Spring days to try some shots of some of these barns in a little more ‘moody’ situation. They’re old and worn out, and like a lot of older things, don’t look their best in the bright light of day. But give them a little darker lighting, a little mood, and they look a lot better.